Quite a simple card today after the excitement (and exhaustion) of yesterday’s shaker extravaganza. And a very different shaped card – you know by now I like to change it up a little occasionally! I bought some hexagon dies a while ago and thought they weren’t getting enough use, so out they came today. I stamped the image with Memento Tuxedo Black ink onto Neenah and coloured it with my Copics (colours listed below) and then I fussy cut it out, but there are coordinating dies available. Next I die cut 2 large hexagons and one smaller hexagon from Neenah 110lb. I scored a line about 1/8″ inch from the top of one of the larger hexagons and put some double sided tape on that. I then placed the other large hexagon on top and adhered them together. I find this the easiest way of attaching two panels together. 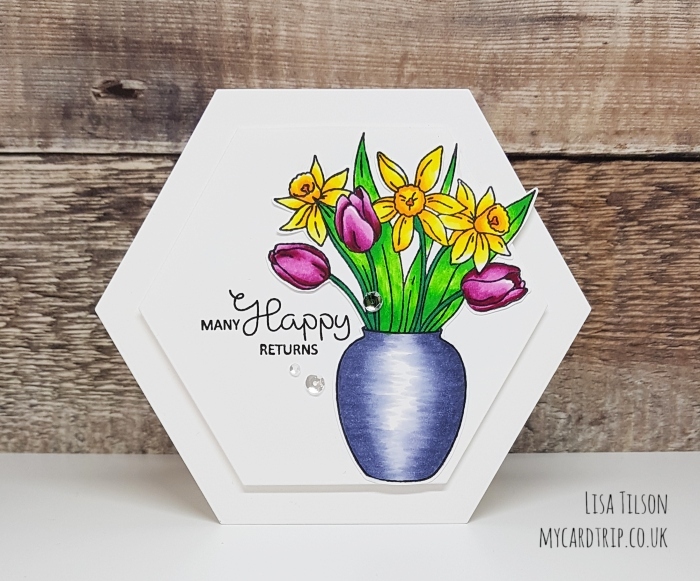 Before popping the smaller hexagon on top with foam tape, I stamped a greeting from Clearly Besotted Scrumptious Occasions using Versafine ink. I then adhered my floral image on with DST, so it overhangs the little panel slightly. To finish I added a few sequins from Lucy’s cards to embellish. Voila! Not overly complicated and I feel a little bit virtuous for using the hexagon dies :). Thank you for stopping by today. I hope you will pop over to see what my teamies have created – Stephanie, Michelle and Keren . I will be back tomorrow with my final teaser for you. Happy crafting! Copics used: Vase (BV20, BV23, BV25), Tulips (RV63, RV66, RV69), Daffodils (Y02, Y08, Y17, YR15), Leaves/stems (YG06, YG09, G17, G05), Colourless Blender. Oh so pretty and your coloring is amazing! Love the hexagon shaped card, I must try this! 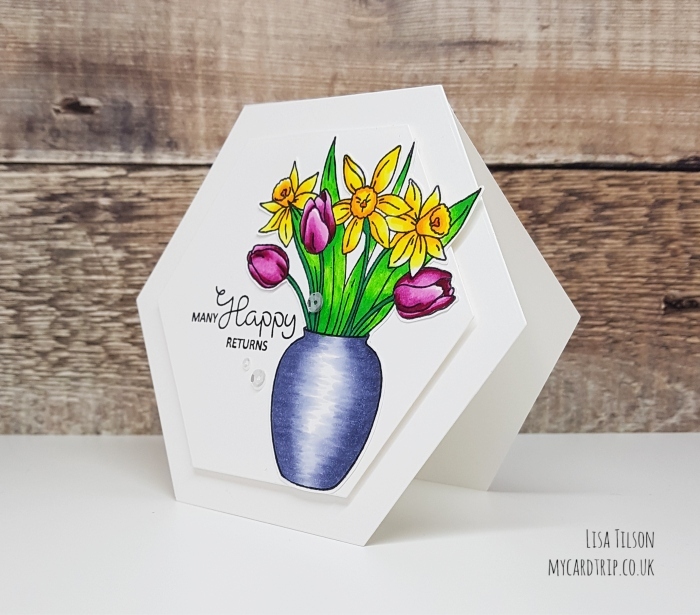 Beautiful spring bouquet card! Love the shape of your card! Beautiful card. Love the hexagon shape. Liking the switch up of your shaping. Very interesting. Beautiful colour combination. I’m not great with florals, they always look like I tried to colour with my eyes shut hehe. Thank you for sharing these & look forward to seeing more tomorrow.